My lace cardigan (and probably to become a twinset). Yes, I broke down and ordered the beautiful Treasure Island cotton (pictured in the photo) from White Lies Design. I won’t tell you what I paid, but it was worth it for the softest cotton I’ve every touched. I had a bit of trouble rolling the skeins up into balls – I can’t believe a knitter of 25+ years and I’ve never handled a skein before. Anyway I got the first one tangled up really good, but my bullheadedness resulted in a ball of yarn instead of a pile of knots. The last bit of great news is I got an invite to Raverly! 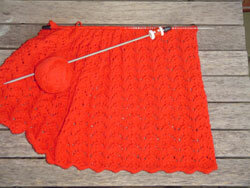 I’m so happy to be part of a cool knitter’s online haven. If you’re looking for me there my user is goodknit. (go figure).